We are pleased to announce our first round of mission-focused grants to help improve and sustain quality performing arts programs. Grants totaling $131,617 have been awarded to two community theatres and six schools. Each of the grantees demonstrated tremendous creativity, dedication, and ambition for quality performing arts programs, and we are honored to partner with them in these efforts. At Phillips Charitable Foundation we’re all about solving problems. We understand that the challenges of sustaining a quality performing arts program can be great, especially with the added financial burden of maintaining up-to-date sound equipment, lighting, instruments, and other infrastructure needs. These advancements help ensure that students going on to university theatre programs can be on a level playing field. We are delighted to have provided funding to solve some of these problems for our newest grantees. 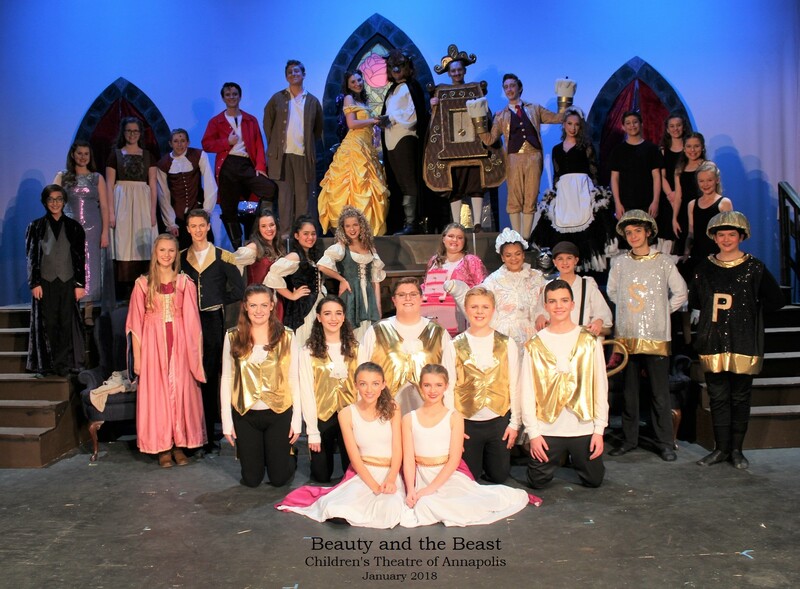 Children’s Theatre of Annapolis, founded in 1959, is a community-based theatre dedicated to nurturing the growth and development of children ages 5-18, through participation in all aspects of the theatrical experience. Each year, CTA produces three mainstage productions and conducts theatre education programming including summer camps, production workshops, masterclasses, and technical internships. Children’s Theatre of Annapolis was awarded a grant in the amount of $20,952. This grant will fund the replacement of the theatre’s lighting system with state-of-the-art LED lights, saving energy costs and helping to bring its production abilities up to the level of a small regional theatre. St. Francis de Sales uses a multi-purpose Parish Center for all performing arts performances. It has beautiful windows that allow natural light to flow in. However, during performances the light was far too intense. Because of the size, shape, and location of the large windows, purchasing and installing room darkening window coverings was cost prohibitive. St. Francis de Sales also needed new storage facilities for their instruments. Phillips Charitable Foundation awarded a grant in the amount of $14,588 for their new curtains and instrument storage. Annapolis Summer Garden Theatre (ASGT), founded in 1966, is an outdoor, seasonal, community theatre led by volunteers. It is both a cultural and historic landmark in downtown Annapolis. ASGT was awarded $11,500 for the purchase of LED theatrical lighting instruments and movers. The LED lights save energy, are easier to maintain, and produce desired color effects. DeMatha Catholic High School was awarded $11,691 to purchase three Conn 8D French Horns. The French Horns will be used by the Wind Ensemble that has consistently received Superior ratings at local and international music festivals. The new equipment will enable this group to continue to perform at this level while also enhancing performances. Established in 1959, Bishop Canevin High School is a college preparatory high school committed to the education and spiritual formation of young men and women. One of their goals is to foster an appreciation for the performing arts. Due to safety concerns, Bishop Canevin had an urgent need to replace the 60-year old stage curtains and related tracking. Phillips Charitable Foundation awarded a grant in the amount of $46,500 for the new curtains and tracking. The Naval Academy Primary School (NAPS) is a preschool through fifth-grade school located just minutes away from the U.S. Naval Academy in Annapolis, Maryland. NAPS began in the early 1900s as a nursery school for children of the Naval Academy faculty and staff, both military and civilian. The school is currently dedicating both time and resources to create a multidimensional music curriculum, providing the opportunity for self-discovery and expression. NAPS was awarded $10,000 to start a violin program for their students, including the purchase of music stands, sheet music, and instruments to enhance and expand their music department curriculum. The goal of St. Mary’s High School Theatre is to provide quality theatre that is educational, enjoyable, and valuable. St. Mary’s was awarded a grant in the amount of $9,481 for a new lighting console for its theatre space. This new console enables St. Mary’s to upgrade to modern theatrical lighting technology. An added benefit is that it will also allow for varied permissions and capabilities for the various users, avoiding problems of errors or misuse of this equipment, and to prepare students entering collegiate level theatre education programs. Holy Trinity offers students specialized training in design, technical theatre, and stagecraft. Doing this well requires up-to-date equipment, preparing students to enter collegiate level design and technical theatre programs. As many school and community theatres are experiencing, Holy Trinity was in need of updated lighting fixtures. The school was awarded $7,960 for this much-needed purchase.